MNPCTech gave ASUS' P67 Sabertooth motherboard a custom paint job, you can check it out over here. 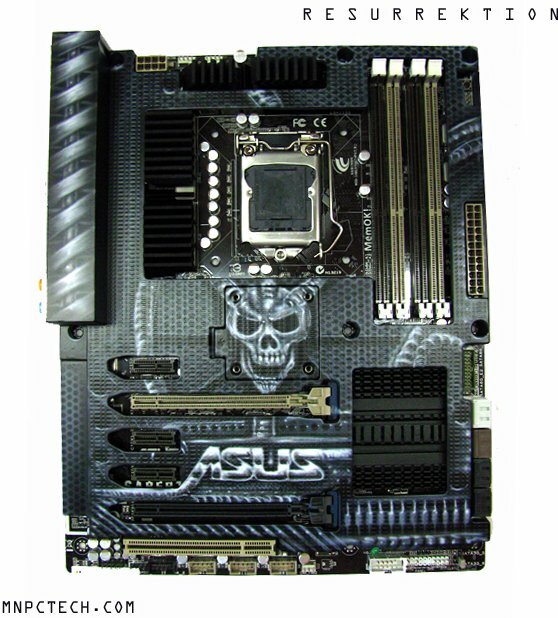 ASUS was the first manufacturer to introduce a cover on their p67 sabertooth motherboard. The “TUF” Thermal Armor (The Ultimate Force) jacket separates the heat generated from all the other internal components from coming in contact with the surface of the motherboard. This Custom PC project, RESURREKTION will have “hand painted” artwork on the TUF shield, that reflects the theme of the modified Cooler Master HAF 912 chassis.